This article is shared from the Fall/Winter 2013 Open Lands Newsletter of the Jackson Hole Land Trust. An inholding – a privately owned parcel amidst public lands – is like one of those missing pieces of a jigsaw puzzle that beg to be completed. You notice them as you drive: a cluster of houses in the middle of miles of unbroken forest, or on a topographic map as a white shape in a sea of green. The Poison Creek property was one such inholding, a once privately-owned 37-acre parcel inside the boundaries of the Bridger-Teton National Forest about 20 minutes south of Jackson, the last along Highway 189/191 before it enters the Hoback Canyon to the east. A special piece of the puzzle, Poison Creek was first identified as a conservation priority in the 1990s. Blanketed by sagebrush and bisected by Poison Creek, the largely undeveloped property was known for offering critical winter habitat for bighorn sheep, elk, and mule deer as well as important habitat for many other species. Various public agencies had sought to purchase the property for acquisition because of its strategic position and high conservation values, but the cost of the property had been prohibitive. That’s when the Jackson Hole Land Trust stepped in, leading an effort to purchase the property in anticipation for an eventual transfer to the Bridger-Teton National Forest. Thanks to generous funding support from the Wolfensohn Foundation, Scott Opler Foundation, Rocky Mountain Elk Foundation, a conservation lender, and private donors, the parcel was purchased in 1997.
concentrating use to minimize impacts on vegetation and wildlife. The trailhead was enjoyed by hikers, hunters, and horseback riders in the summer and fall, with access closed during the winter and spring to protect wintering wildlife. Over the years, the Bridger-Teton National Forest had pursued funding to purchase Poison Creek from the Land Trust and complete the transfer. This May, they received notice from the Land and Water Conservation Fund (LWCF) – a federal program that receives a percentage of proceeds from offshore oil and gas royalties for the protection of irreplaceable lands and improvement of outdoor recreation opportunities across the nation – that funding would be available for the project. By August, thanks to a partnership between the Jackson Hole Land Trust and The Conservation Fund, Poison Creek officially became part of the National Forest. “Poison Creek has been a top priority for us for years, so when we found out that the LWCF funding would be available for use in the Greater Yellowstone Area, we moved quickly,” said Michael Schrotz, Bridger-Teton National Forest Planning and Lands Staff Officer. Advocates of LWCF funding for the project included the Rocky Mountain Elk Foundation, Snake River Fund, Wild Sheep Foundation, Wyoming Wild Sheep Foundation, Jackson Hole Conservation Alliance, and Teton County Commissioners. Negotiating and completing the complex land deals within an expedited time frame was an exciting challenge. The Conservation Fund helped facilitate the swift land transfer, contributing their experience working with private-to-public land transfers at the regional and national levels. 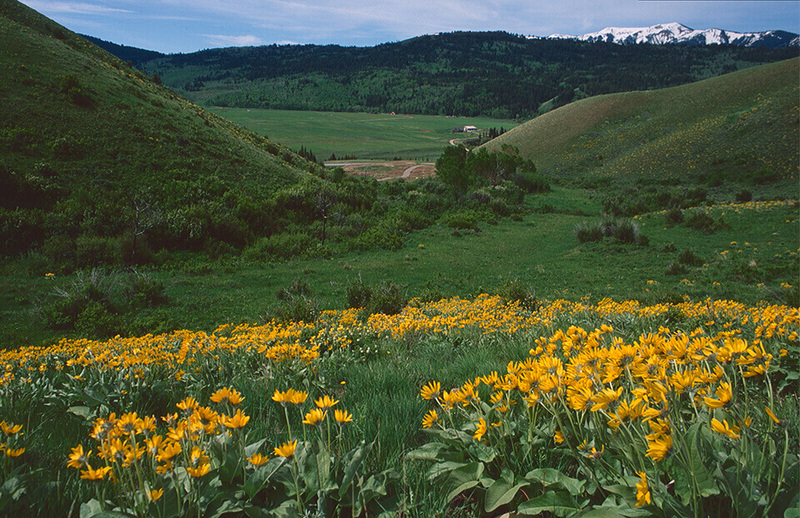 “Partnerships have always been essential to the success of this project, and we are incredibly grateful to The Conservation Fund, the Bridger-Teton National Forest – as well as our original partners – for all that they contributed to see this LWCF project to completion and fulfill the original intent of this conservation project,” reflects Laurie Andrews, executive director of the Jackson Hole Land Trust. What’s next for Poison Creek, now that it’s been colored Forest Service green on the map? To the public, the transition from Land Trust management should be seamless. From the management side of things, it has now become part of the 3.4 million acres of public lands managed by the Bridger-Teton National Forest and guided by BTNF’s Forest Plan, which means that wildlife habitat will remain unfragmented and public access for a variety of users has been ensured. The Jackson Hole Land Trust plans to commit the funds from the Poison Creek sale towards priority Forest Service inholding conservation projects in the 18 million-acre Greater Yellowstone Area – other puzzle pieces that we hope to help color green. Like Poison Creek, such projects have incredible value for keeping this important ecosystem intact and for inspiring partnerships. This week’s location was a little farther afield than our other View22 locations. Finding the Poison Creek protected property turned out to involve a scenic drive that took me south of town and miles up the Hoback, a beautiful valley of sagebrush, forest, and cliffs with a clear river running right through it – and no cell reception. After several rounds of driving right by the tiny dirt road that leads to the Poison Creek trailhead, I found Trio artist Jennifer Hoffman, her adorable daughter Amelia, and their dog Sammy. Jennifer let me know that their family has been coming up here for years, so she already had a feel for and connection to the property. She pointed out an area up ahead and uphill where she thought she might be able to get a good view of the landscape. Twenty minutes later, far surpassing our original goal, we set up shop in a small grove of aspens. From here, I could see everything around us, and across the way to a small little pastoral valley of its own called Bryant Flats. I am realizing with each of these outings that there is always something new to discover in Jackson Hole and its surroundings! On our hike up, I gained an enormous amount of respect for seven-year-old Amelia, who knew about every plant and wanted to catch every bug. As opposed to being obsessed with video games and other vices and devices of the modern age, Amelia made her own fun through nature. She is awesome – and how could she not be with a mom like Jennifer! Jennifer is definitely passionate about nature, and it shows in her art and her observations. She pointed out so many things about the natural around us that I would not have noticed otherwise, like the kestrels flying and the abnormally large aspens. Before I knew it, the light was changing, signaling our cue to start packing up. On our way back down to the trailhead, Amelia explained to me her interest butterflies and different colors of Indian paintbrush. Kids in the valley are so cool! I was sad that this would be the last time I would get to go out painting exclusively with Jennifer this summer. She is just amazing. This painting session is scheduled for August 1st, 2013! Sign up to receive email updates from us to the right so you get our blog posts right in your inbox!